MCADCafe Editorial - Is The The Sprout Helping HP Grow? « Is CD-adapco A Good $1 Billion Fit For Siemens? Is The The Sprout Helping HP Grow? Being the editor of MCADCafe, I am constantly on the lookout for innovative software and hardware products that make working life better for designers and engineers. While some of these products are truly unique, many are retreads and “me too’s” of existing offerings. Lately, I’ve been especially watchful on the hardware platform front, because it doesn’t seem as compelling as it once was, much to the credit of escalating cloud-based hardware and software services. 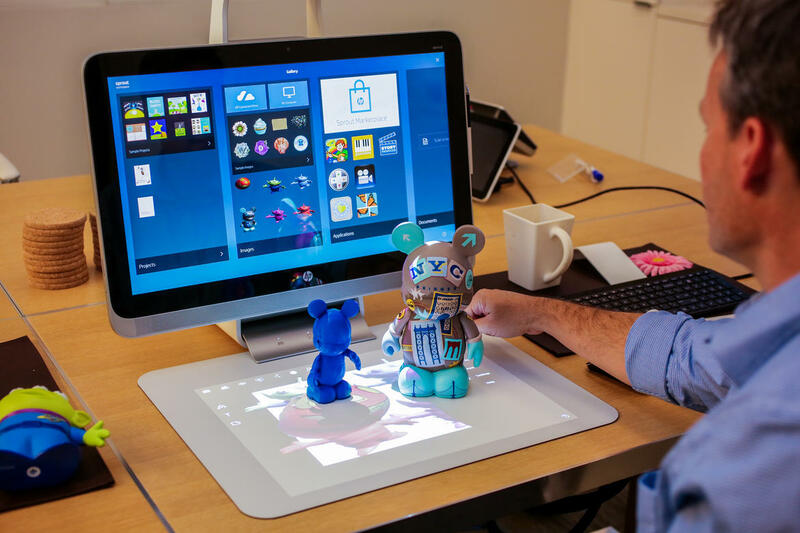 However, something really caught my eye last year – the HP Sprout – a computing platform that is truly unique because it is a desktop computer but is also has an integrated 3D scanner for 3D object capture and editing as well as 3D print options. In a nutshell, the Sprout is a relatively high-end Windows 8 computer with a novel two-screen configuration and advanced cameras, which combined can make some creative activities possible. The second display, on a desktop touch sensitive mat, is a major advance in the physical user interface for computers. The MSRP is ~$1,900. Not inexpensive, but not bad for all that the Sprout is capable of doing. HP spent almost five years working on the technology for Sprout. It gathered sensors, cameras, touch devices, and dual-screen display technologies, along with its computer capabilities, but had to wait for some of the technologies to mature and become more affordable. The ambitious goal was to redefine interaction with a computer. Easier said than done. Sure, the world is 3D, most people think in 3D, and computers really need to work in 3D, and that’s where HP placed its bet on thinking about the direction of the interface and workflow. Ultimately, HP wanted to make the creative process of building 3D objects easier, analogous to capturing, manipulating, and printing a photo. The company also wanted the process to be seamless and simultaneous. But, how to pull 3D content into a computer and manipulating and seeing things from multiple perspectives? Early on in the design process it was determined that both projected light for the 2D capture process and a 14.6-megapixel high-resolution camera were required. By combining the two processes using a structured light scanning process, HP was able to capture objects in 3D. That’s a simplistic overview, but that’s basically how it works. HP employs three methods for scanning objects into Sprout. The first uses Intel’s Real Sense camera that captures imagery as part of its ability to sense gestures. The design team also implemented photogrammetry, basically taking a series of 2D photos and stitching them into a 3D image. For high-resolution capture, HP uses visible structured light-scanning process using a digital light processing (DLP) projector. The camera has a 200-micron scanning resolution (0.2 millimeters). Not unexpectedly, the hardest part of the system was creating software for manipulating the captured images. This is a big part of the human/computer interface where by looking at a scanned object and discarding the errors and artifacts that don’t belong there. This process is relatively easy to do with a few touchscreen taps. What is the HP Sprout? So, there is no doubt that HP’s Sprout is unique, but how has it been accepted and how well is it selling? HP has not been forthcoming with sales figures, so I can’t even begin to surmise how it’s doing. However, I have been to a couple Maker events where the Sprout was being demonstrated and the owners seemed quite pleased with the results. Admittedly, the objects being scanned, edited, and printed were relatively simple, but the results were quite impressive. EDITOR’S NOTE: I’d like to take a closer look at HP’s Sprout and really see what it’s like for myself. I have contacted HP for an evaluation machine and will write a comprehensive review on my experience if the company will release one to me. Stay tuned! This entry was posted on Thursday, February 4th, 2016 at 17:48. You can follow any responses to this entry through the RSS 2.0 feed. You can leave a response, or trackback from your own site. Thanks for the nice piece. I have been talking about an alternative digital thread using AM, but this platform takes it to the extreme. Not sure if HP is making money or not, but it is a really interesting package.